I love Agatha Christie. As a middle school student, I devoured Christie's books. Over time, the passion has tempered a bit, though And Then There Were None (aka Ten Little Indians) still remains among my favorite books. Christie herself was not particularly fond of the film adaptations of her work, in particular with the four films based on her Miss Marple character. Miss Marple, a spinster whose sharp intellect unmasked many a killer, was one of her two great detectives (the Belgian sleuth Hercule Poirot the other). 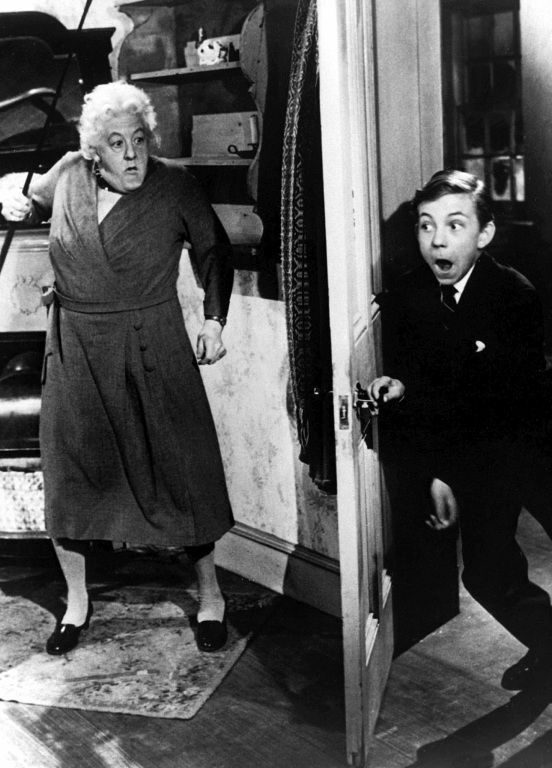 Murder She Said, the first of the four Miss Marple films, may not be faithful to the original novel it's based on (4:50 From Paddington), but it functions well for what it was meant to be: a lighthearted mystery romp, with a charming turn by its star, Margaret Rutherford. Miss Marple (Rutherford) is aboard a train when she looks out the window and is shocked to see a woman being strangled on another train riding next to hers. The police don't believe there was any murder, especially since they didn't find a body anywhere on route. Miss Marple, being a fan of murder mysteries, decides she will investigate the crime herself. Aiding her is the librarian Mr. Stringer (Rutherford's real-life husband, Stringer Davis), who is covertly sweet on her. Soon, Miss Marple's investigations lead her to Ackenthorpe Hall, where she finds just enough evidence to suggest the body of the murdered woman is there. She decides to go undercover as a maid, and finds the Ackenthorpe family a very unhappy one. Ruled by comically tyrannical Mr. Ackenthorpe (James Robert Justice), about the only child willing to tolerate him is his widowed daughter Emma (Muriel Pavlow). All his sons save Edmund (who was killed in the war) stay as far away from Ackenthorpe Hall as possible, coming only when required. Ackenthorpe's only grandson Alexander (Ronnie Raymond), a most mischievous fellow, is also at the Hall. As the investigation goes on, Miss Marple manages to find the body. Now the family knows there is a murderer about. Things grow more complicated when it's discovered that the murdered woman may have been Edmund's hereto unknown widow, the product of a wartime marriage in France. If it's proven that she was Edmund's widow, then it must have been someone in the family as only they would benefit from her death. Emma has her own complications, as she and her father's doctor, Dr. Quimper (Arthur Kennedy) are in love but find that revealing their relationship at this time is out of the question. More suspects...and more bodies...keep popping up, until Miss Marple at last, with a little accidental help from Alexander, realizes who the killer is. Once brought to justice, Miss Marple leaves for her home, but not after turning down a surprise marriage proposal from the cantankerous Mr. Ackenthorpe. Off she goes with Mr. Stringer, still very sweet on Jane, and as they ride off together, both are unaware that Alexander has tied a bunch of cans behind their car with a "Just Married" sign to it. Murder She Said is not 4:50 From Paddington. You know this straight off the bat by the book's alternate American title, What Mrs. McGillicuddy Saw. Based on that, you can deduce that it was Miss Marple's friend Mrs. McGillicuddy who witnessed the murder, not Miss Marple herself. There are other changes, large and small, from book to screen. Christie disliked the whole thing, but while I tend to be on the purist side of film adaptations, I can forgive Murder She Said because the film didn't set out to be a serious drama. Instead, Murder She Said is meant to be a light, almost comic film. We know this first and foremost by Rutherford's take on Marple. The stout, endearingly haggard Rutherford was nothing like the prim, proper, but shrewd Marple, a woman with a dark idea of human nature. She makes Marple not into a figure of ridicule, but not someone who is inwardly suspicious of all people. The comedic nature of Murder She Said comes into the foreground particularly whenever Rutherford and Justice face off. When Emma introduces the new maid, Jane, Ackenthorpe quickly turns to his gardener/footman and says, "And a plainer Jane I've never seen", to which Jane replies with aplomb, "We can't ALL be good-looking". 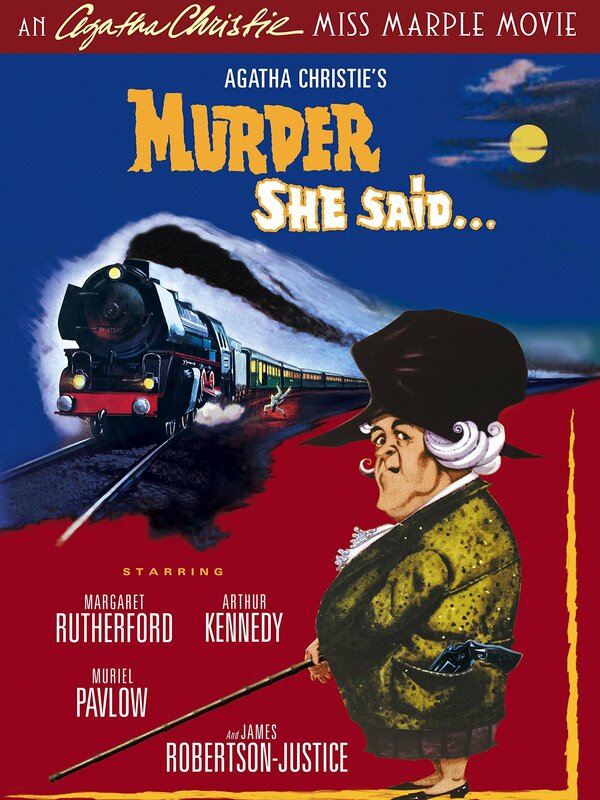 The verbal sparring between Rutherford and Justice, full of quick quips, verbal insults, and physical comedy, clearly shows that Murder She Said would mix, as the trailer says, "murder and mirth". The comic elements are also evident in the scenes between Rutherford and Davis. It's clear that Mr. Stringer is very sweet on Miss Marple, but whether Miss Marple returns the feelings isn't revealed. There is a suggestion that she might eventually marry Mr. Stringer when she turns down Ackenthorpe's marriage proposal, saying that if she ever would enter that venture, it would be with someone else...perhaps the man picking her up from her latest adventure. Davis and Rutherford have a wonderful rapport with each other, and together they lend more comedic elements to the story. For those of us who are Christie fans, a particular highlight is the meeting of the two women best known for playing Miss Marple. 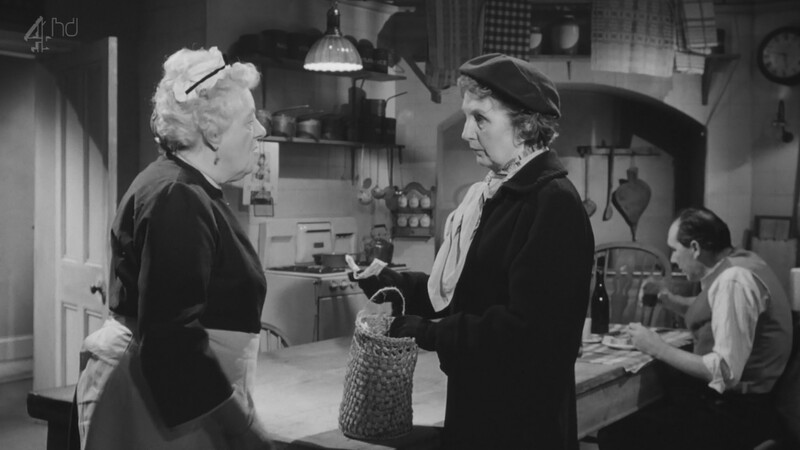 Joan Hickson, who would go on to play Marple in the highly acclaimed television series, has a small role as a part-time housekeeper. It's interesting to see Hickson, whom I remember as the definitive Miss Marple, playing someone of a far lower social class than the more upmarket Miss Marple. It shows that Hickson was a far more diverse actress than she was given credit for. If there is any debate as to whether Rutherford or Hickson made for the better Miss Marple, I would remind people that they were essentially playing two versions of the character. Rutherford was playing a more lighthearted Miss Marple, while Hickson was playing it more straight. Each succeeds in her own way to make the character her own, and while I personally favor Hickson, after watching Murder She Said, I find Rutherford was endearing, charming, and most pleasant as Miss Marple. Both played the part correctly as they were written and directed, so both of them make ideal Miss Marples. I found Murder She Said sometimes dragging slightly (despite its remarkably brief running time of 80-odd minutes), but apart from that the whole film can correctly be called 'a romp'. We know this by the Ron Goodwin's light musical score; we can also tell from the fact that after the murderer was unmasked, we had a sight gag. The murderer had tried to kill Marple with poison but was stopped by the police, who were listening in. Once the murderer was removed, the Inspector turned to Marple, only to find that she had fainted dead away from delayed shock. If you look at Murder She Said as a romp, something of a trifle to be enjoyed for a lighthearted take on murder, with a somewhat dotty but endearing detective, then you can enjoy it for the amusing picture that it is. It may not please Christie purists (and it didn't please Christie at all, though in time she came around to the benefits of Rutherford's role in popularizing the character, dedicating a Miss Marple novel to her), but as a light treat with some deadly delights, Murder She Said is a pleasant diversion.